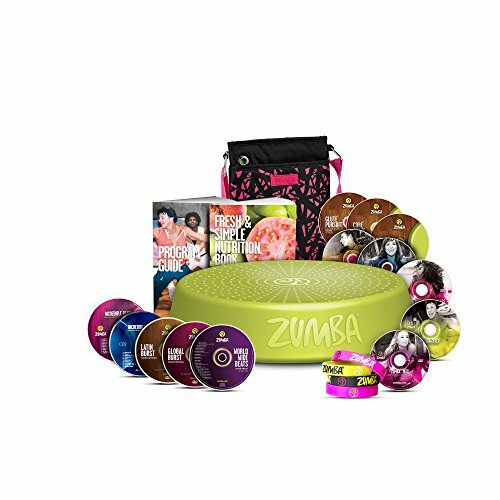 Zumba incredible results system includes: quick start + 20-minute express super cardio dance party featuring cardio burst intervals zumba step DVD featuring the zumba Rizer zumba Rizer 30-minute burn + amazing ABS fresh & simple nutrition book feat. The 7-Day rapid results eating Plan & everyday weight-loss Plan the ultimate kit also includes: zumba incredible beats cd: over 20 zumba tracks from the incredible results DVD collection - including salsa, electro dance, rumba flamenca, reggaeton, champeta and more. Zumba max DVD: super high-energy live class featuring fast-paced music and crazy-fun dance moves (60 minutes). zumba step it up DVD: this high-intensity total body workout will give your dance-fitness an extra boost, helping you get the most out of your zumba rider (35 minutes). zumba glute pursuit DVD: this results oriented session focuses on gluteus and legs, giving you an electrifying and highly concentrated workout with the zumba rider (30 minutes). zumba core craze DVD: this highly targeted workout provides powerful core conditioning, yielding fierce results using your zumba rider (30 minutes). zumba global burst DVD: kick up your moves with cardio burst intervals as you dance-it-out to international beats. This total-body dance party will give you full results in half the time (29 minutes). zumba Latin burst DVD: give your dance-fitness an extra cardio burst while shaking in to the sounds of Merengue, salsa and reggeaton. This interval Fiesta yield results in a fraction of the time (30 minutes). zumba world wide beats cd: this international Fusion combines the sounds from Latin burst and global burst. Zumba Hello gorgeous Crossbody bag: ramp up your fashion with stylish and functional accessories like this Hello gorgeous Crossbody bag. Zumba bracelets: add flair to your look with the fashionable zumba bracelets, 4-Pack.